In 1979 work began on a rally-spec Opel. Both the Ascona B and the Manta B were used for this. Although the Ascona 400 model was the more successful of the two, the fact still remains that the Manta 400 was a remarkable car. Opel joined forces with German tuner Irmscher and Cosworth in Britain, to make the 400. 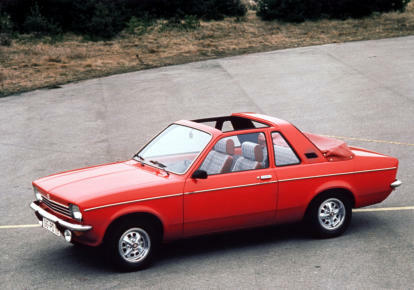 Cosworth was given the task to develop a 16 valve 2 cam head for the CIH spec engine block, and Irmscher who earlier in 1977 and 78 had proven that they knew their way around an Opel building the i2800, was to design the exterior and interior of the cars. The results were not bad. Opel however had problems with the engine. The first idea of using a 2.0 litre engine and then using the 16 valve head from Cosworth simply did not give enough power. The problem was that the heads had already been built, so the heads were made to fit on the CIH type 4 cylinder engine block. So they built an unusual engine using a 2.0 litre engine block with an overbore and larger pistons, a crankshaft from the 2.3 litre diesel engine of same type (CIH) and ended with a 2.4 litre engine block. Mounting the 16 valve head on this gave a massive output, and the opportunity to make several tune-ups for the rally drivers. 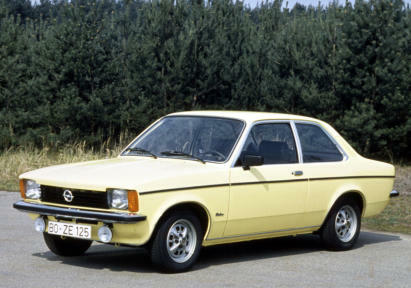 Opel delivered the first 23 specimens in 1981 which were recognizable by the 2 slot front grille (1982, 83, and 84 models had 4 slot grilles). The cars were delivered as both street cars and factory tuned rally cars. The street cars known as Phase 1 cars, were luxury versions of the known Manta B Coupé. Although all the changes to give the body more strength were still implemented, the cars were delivered with all kinds of exclusive packaging. 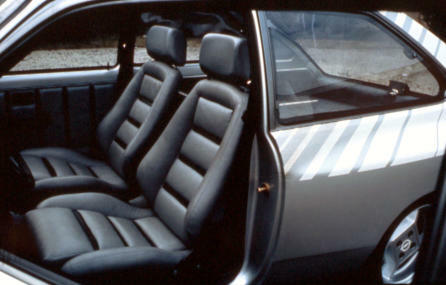 Recaro seats with big Opel badges on the cloth, Irmscher leather steering wheel, and even front light washers were mounted. The cars were all delivered in Arctic White colour, with White Ronal lightweight 7x15" alloys. The engine was fitted with a Bosch LE injection system and power output was 144 bhp (107 kW). The Phase 2 however was quite different. It had large extended arches front and rear made of exotic materials like carbon and kevlar to keep the weight down, lightweight doors, bonnet, spoilers and windows. The wheels were still from Ronal but now measuring 8x15" front and 10x15" rear. The engine output was 230 bhp (172 kW) using a set of 48 mm (1.9 in) DCOE style carburettors, and the cars could be delivered with different gearboxes from ZF and with different rear axle options like LSD. Phase 3 which is also a term used when talking about the i400's was not a factory tune-up. Many racers of the time had their garages tune up the engine even further. Some made it across the 300 bhp (220 kW) mark and even today, engines can be tuned to deliver just over 340 bhp (254 kW) still normally aspirated. The i400 was produced in a total of 245 specimens following the homologation regulations by FISA (today FIA). But the i400 also spawned some other "i" models. The i200 which basically was a GSi model Manta B was made in 700 specimens and is still today considered a collector's item. The i200 used a tuned 2.0E engine delivering 125 bhp (93 kW). 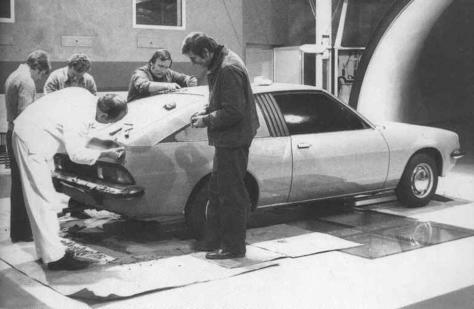 The i240 which is rarer was only produced in 300 specimens and was fitted with the i400 engine block but using a normal 8 valve cast iron head from the 2.0E engine delivering 136 bhp (101 kW).A 4WD Manta 400 was produced and was tested by Ari Vatenan for a period of time but it was not raced and was really only a stop gap before the New Opel Kadett Group S car was produced. Though this was near completion and Group S was band like Group B and it only ever competed in a handful of events. Jimmy McRae in the Opel Manta 400. The Paul Maaskent/Lee Towers Opel Manta 400 from 1989. Russell Brookes in his Opel Manta 400 on the British Open Championship. Bertie Fisher’s Opel Manta 400. 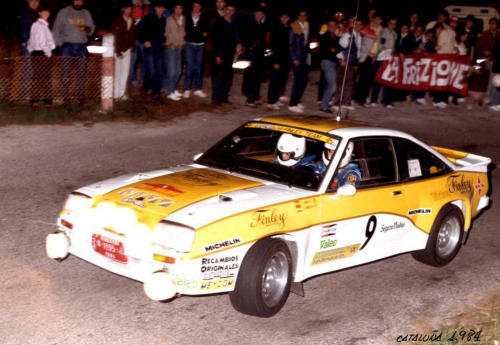 Herri Toivonen’s Opel Manta 400 in 1983. 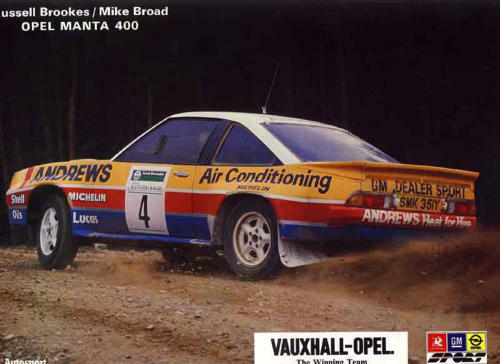 Russell Brokes and Mile Broad in the Andrews Heat for Hire Opel Manta 400. Andrew Wood on the National Break Down Rally in his Manta 400. Penti Arikila in his BT Mobile Phone backed Manta 400 in 1987. Carlos Sainz better know for his exploits at Toyota also raced a Manta 400 in 1984 on the Spanish National Series. 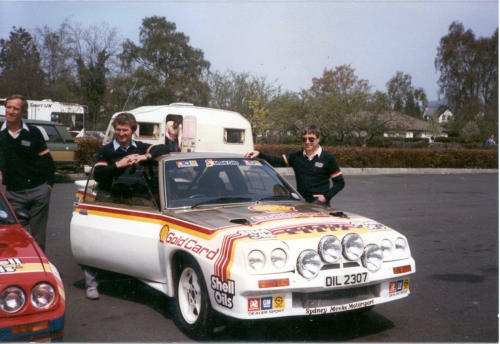 Bertie Fishers Shell Gold Card Sponsored Opel Manta 400.